It’s not unusual to see a yogi or yogini riding along on their BIXI, with yoga mat in basket! 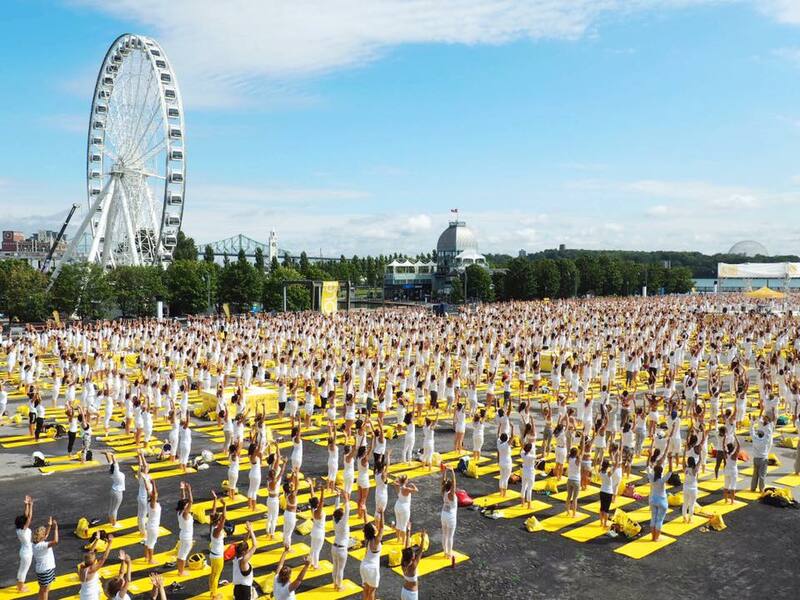 We know our users are big yoga fans, so we’ve joined forces with the Montreal yoga community. Jump on your BIXI and take advantage of these great summer offers! Are you taking part in the Lolë White Tour? We’ve slipped 2-for-1 single trip BIXI coupons into the gift bags of all participating yogis. And keep an eye out on our Facebook page throughout July, 10 lucky draw winners will receive passes to the event. New to yoga or want to try out a different style? You can do both thanks to this impressive program. An entire series of unique and free events! This huge gathering is one of Montreal’s don’t-miss events! Take part in this uplifting experience! Yoga along the banks of the Lachine canal! Free open-air yoga session. Let your mind and body be carried away by the whispering breeze in the treetops. Pedal hard and practise yoga all summer long! Don’t miss the next Free BIXI Sunday event offered by Manuvie on July 29th! Simplify your trip there by downloading the BIXI app from the Google Play Store or Apple Store. *This offer is valid on your next Lolë purchase (excluding Lily Tote). Available for use online at lolewomen.com or in Lolë participating stores only. Outlets not included. Limit to one coupon per customer. Cannot be redeemed for cash or credit. Cannot be combined with any additional promotions or used on sale items. If your coupon is lost or stolen, it cannot be replaced. This offer is valid for Canada use only. Valid until July 31st, 2018.